I clipped the back section. 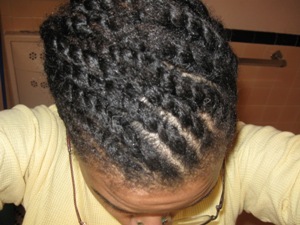 In the front section, I made 9 two-strand cornrow twists. 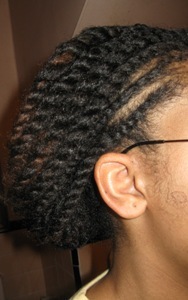 These twists are made in diagonal parts toward the right of my head. The first diagonal part starts at my temple and goes back toward my ear. Step 3: Start as if you are making a french roll; gather your hair in a ponytail with your hands. 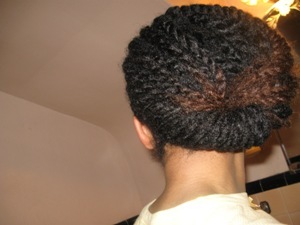 Then twist the pony tail about halfway. 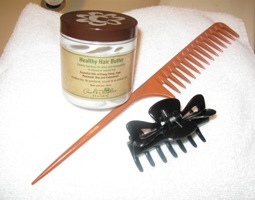 Make sure you have extra hair that's not twisted. 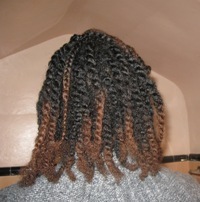 Then stuff the extra hair downward into the middle of the twist. Keep stuffing the extra hair into the twist and also roll the sides of your hair in toward your head (see top picture on right). When all of the extra hair is smoothly rolled into the twist, then with a bobby pin secure the hair inside the twist.